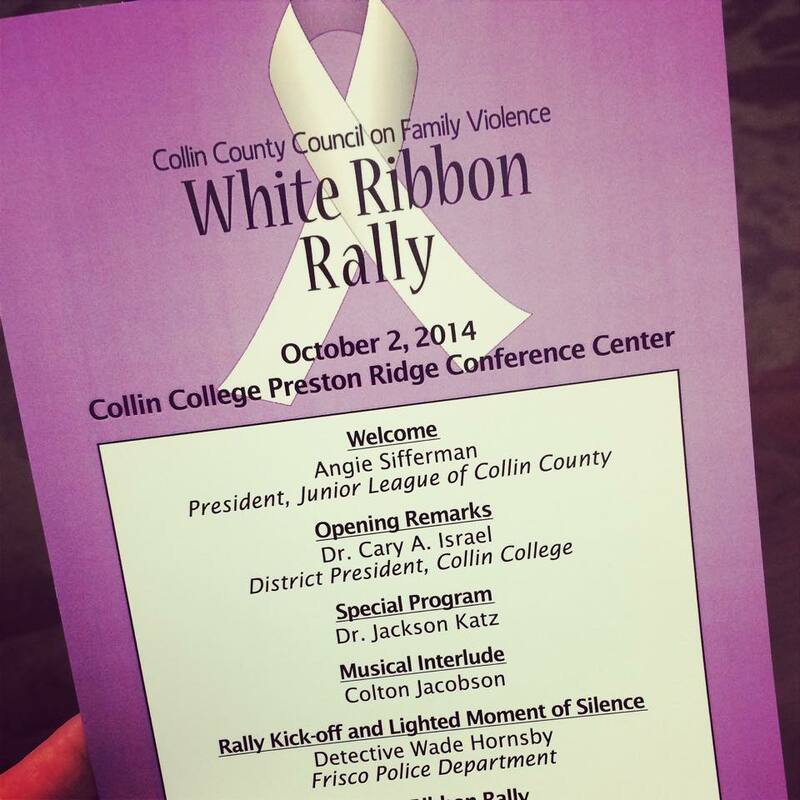 The idea for the Collin County Council on Family Violence began in 1999. The work of The Council continues today through the efforts of many volunteers and partner organizations. We launched a new website March 2017. 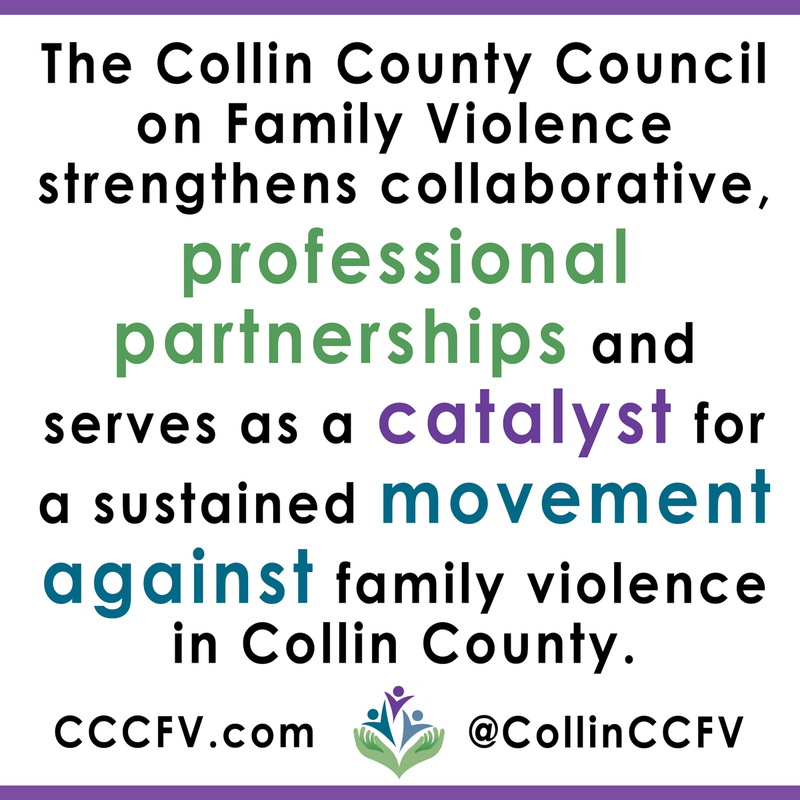 We approved a new mission statement June 2017: The Collin County Council on Family Violence strengthens collaborative, professional partnerships and serves as a catalyst for a sustained movement against family violence in Collin County. The 10th annual Facing Family Violence Conference was held at Collin College in 2012. 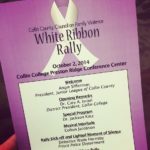 Collin College partnered with The Council to host the first White Ribbon Rally in 2013 where men take a stand against violence and abuse in all its forms. 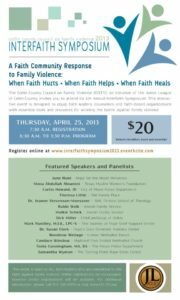 The Family Violence Interfaith Symposium was created in 2015 when clergy, counselors, and pastoral staff desired more extensive training in response to members of their faith communities relying upon their counsel in difficult times. Our annual conference is renamed The North Texas Facing Family Violence Conference in 2015. Presentation of Feasibility Study for the Collin County Family Justice Center by Jacobs Consultancy. Conducted the first Business Summit in 2006 to educate the business community on family violence and violence in the workplace. Conducted training for school counselors and principals on family violence in 2007. Final Business Plan for the Collin County Family Justice Center was presented. 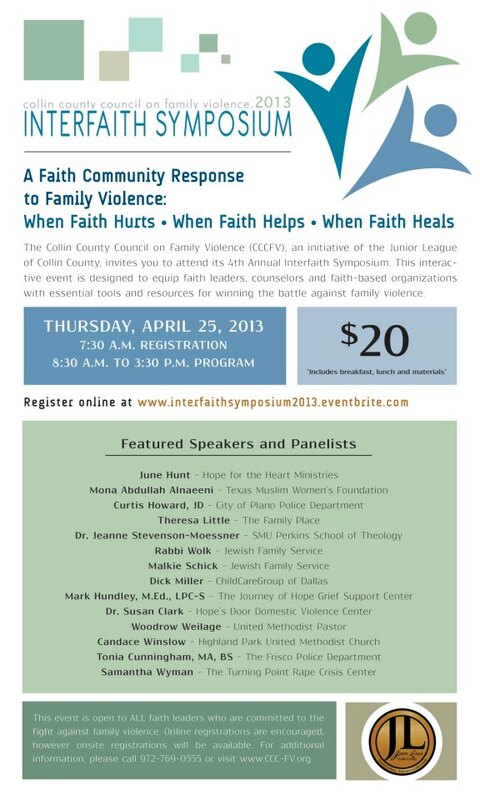 Held a Faith Symposium for faith leaders in the community in 2010. Conducted the Next Steps Session. 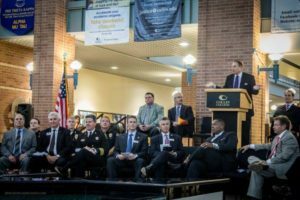 Law enforcement, the District Attorney’s office and all Collin County hospitals collaborated to create the Uniform Medical Release for victims of family violence. Launched database to track and effectively report family violence statistics. Created Faith and Family brochure for distribution in faith communities and held first Faith Education Breakfast for North Texas faith leaders. The brochure has been distributed to faith communities across the U.S. Designated by Governor Rick Perry to serve as the model for collaboration for the State of Texas. Collaborated with the Governor’s Commission for Women to create “You Have A Choice” a resource brochure for batterers. The brochure was distributed to every law enforcement agency in the State of Texas as well as education and faith communities in Texas and other states. Created the safety plan lipstick tube for victims of domestic violence. Participated in District Ten Counselor Workshop, educating school counselors on family violence and resources available. Conducted county-wide needs assessment on accessibility of services. Protocol teams developed the Continuum of Caring, a blueprint for the public response to family violence. The District Attorney, and subsequently the County, approved a budget to create the Family Violence Unit and established a “No Drop” policy for domestic violence (if a victim of domestic violence does not show up to court to testify against the defendant, the case is not dropped). The Wylie Police Department, Collin County Sheriff’s Office and Plano Police Department created the Family Violence Checklist for domestic violence calls. The Council began researching collaborative housing for family violence responders, including site visits to San Diego, CA and Maricopa County, AZ. The Council reviewed and approved the final version of the Community Coordinated Response Plan. It was presented to the public in October via an event titled “Laying the Foundation: The Community Response Plan.” Texas First Lady Anita Perry was our guest of honor. 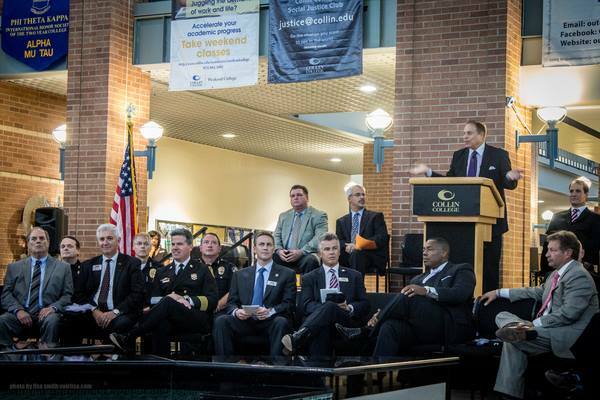 A SANE program began in Collin County for sexual assault victims. A Sexual Assault Nurse Examiner (SANE) is a registered nurse who completed additional education and training to provide comprehensive health care to survivors of sexual assault. The Council hosted its first Facing Family Violence Conference in October 2003, receiving national recognition for its multi-disciplinary approach to community education. Twelve on-site interviews of key stakeholders. Held a workshop for 150 community leaders and elected officials titled “Key to a Safer Community: Reducing Family Violence” to provide education and a sense of commitment to the community to address family violence. The formation of the Collin County Family Violence Steering Committee composed of the Junior League and five key stakeholders. The Steering Committee hosted community leaders in a professionally facilitated retreat titled “Reducing Family Violence by Evolving a Process of Closer Cooperation” in March 2000. Participants committed to working together and developed a Vision Statement and indicators of success. 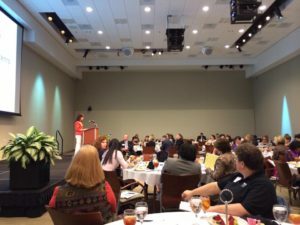 Along with Presbyterian Hospital of Plano and the University of North Texas, the Steering Committee conducted an independent assessment of family violence in Collin County. The report, “The Violence Prevention Assessment Guide for Collin County,” was presented to the public in December 2001. 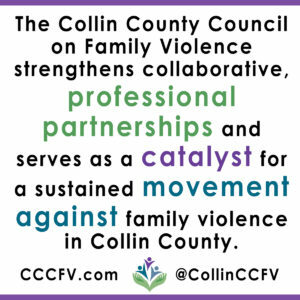 The name Collin County Council on Family Violence (The Council) was adopted and the Council began meeting monthly.